I failed to mention in the last post that not only did I provide therapy in the self-contained special education classrooms, but that for four years my "speech room" was in self-contained classrooms. For two years, I roomed with one of my best friends in her early childhood classroom. The walls to my "speech room" were made of cabinets and I could see all that was going on from my desk. During another two year period, I had a desk in one of several self-contained special education classrooms in my school. Those two years, I moved from room to room conducting therapy in each student's special education classroom. When working in these classrooms, the teacher's understanding of the SLP's role is very important. Most liked having the extra help in the room; however, some wanted me to tutor and others considered my time in their classroom break-time. The majority were easy to work with and were willing to collaborate. Therapy in the classroom worked when I spent some planning time with the teachers and the goals, procedures, and materials were discussed. One year, I co-taught Everyday Math at the kindergarten level which was great for my students with severe articulation disorders. I have taught several aspects of language arts and social studies, but my favorite years were when I conducted three whole classroom sessions weekly while teaching science concepts. Not only can science be fun, but it is very interactive and perfect for speech and language activities. For students with very limited language skills, there are a lot of opportunities for language learning and active participation. AND, activities and materials are age appropriate. When learning about matter, students can tell the sequence of events that occur when matter changes state, predict outcomes, respond to questions about the changes, describe attributes, and sort and classify. 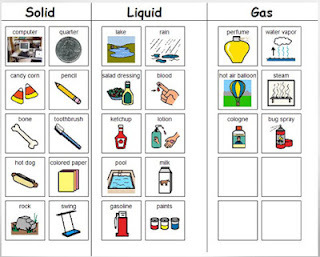 Download my PowerPoint book, The ABC Matter Book, that was used as a describing activity and to reinforce vocabulary as part of a science sorting activity. 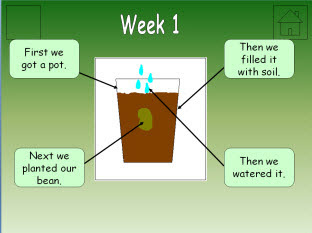 Plant a bean seed and students can tell about the growth sequence, make predictions, label parts of a plant and tell the functions of each part, describe a variety of plants and make comparisons. 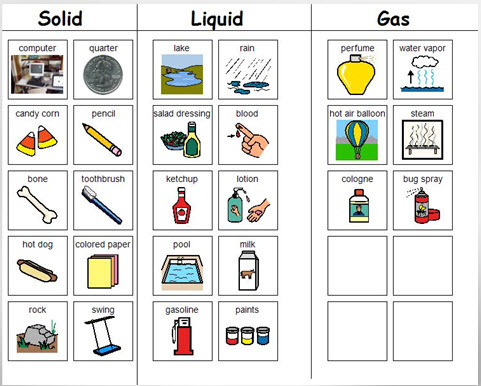 There are many websites with great visual supports and science activities. Find wonderful activities at Science Online, BBC's Bitesize, Edheads, and Dragonfly TV. Many videos and resources can be found at Discovery Edcuation - most schools have subscriptions to this site. If you have Boardmaker, make sure that you look for science activities at the BoardmakerShare site. I absolutely love the ABC Book of Matter! This will be invaluable for my English Learners next semester. Thank you so much for sharing this; it is very much appreciate your excellent work.